MANILA, Philippines (UPDATED) – For years, the issue on who owns what in the West Philippine Sea (South China Sea), a major maritime highway and a resource-rich area, has been disputed by a number of countries. One of the main issues is China's "historical" claim outlined by a 9-dash line, which gobbles up large areas of the Exclusive Economic Zones (EEZs) of the Philippines, Vietnam, Malaysia, Brunei, and Indonesia. In the past years, China has asserted its sovereignty over islands within the Philippines' EEZ. In 1988, China seized Subi Reef, which lies within the continental shelf of the Philippines, by erecting a radar structure and military facilities on the reef. In 1995, China seized Mischief (Panganiban) Reef from the Philippines. Mischief Reef, located 125 nautical miles from Palawan, is a low-tide elevation (LTE) within the Philippines' EEZ. The territorial dispute between the Philippines and China flared up again after an incident at the Quirino (Jackson) Atoll in 2011. Here is a timeline of events, starting from 2011, in the maritime dispute between the two countries. February 25 | The Chinese frigate Dongguan fires 3 shots at Philippine fishing boats in the vicinity of Quirino or Jackson Atoll. The shots are fired after the Chinese instructed the fishing boats to leave, and one of those boats experienced trouble, its anchor removed. March 28 | The Philippines bolsters its military presence along its western maritime border following an incident with two Chinese boats which threatened to ram a survey ship conducting seismic testing. May 23 – A News5 report shows that military garrisons and outposts have been built by China in 6 reefs that are part of the Kalayaan Island Group. June 4 – The Philippines' Department of Foreign Affairs begins referring to the body of water as the "West Philippine Sea." July 4 | China protests the Philippines' invitation of bids for the exploration of Area 3 and Area 4 in the Reed Bank and tells the Philippines to "refrain from any action that infringes on China's sovereignty and sovereign rights." October 20 | A Philippine naval ship rams a small Chinese fishing boat in disputed waters near the Reed Bank. The Philippines promptly issues an apology to the Chinese embassy in Manila, saying it was an accident. April 8 | 8 Chinese fishing boats venture into Scarborough Shoal and are spotted by a surveillance plane from the Philippine Navy. April 11 | Philippine surveillance aircraft identify Chinese fishing vessels at Scarborough Shoal, causing the Philippine Navy to deploy its largest warship BRP Gregorio Del Pilar – newly acquired from the United States – to the area. In response, China sends surveillance ships to warn the Philippine Navy to leave the area, claimed by both countries, prompting a standoff. April 12 | The Philippines pulls its biggest warship out of a standoff with Chinese vessels, but the impasse is not resolved, with China sending a third ship to the disputed waters. April 16 | The armed forces of the United States and the Philippines begin their annual Balikatan military exercises on and around the island of Palawan in the South China Sea. Coinciding with the territorial dispute, the drills prompt protests from China. May 16 | A fishing ban at Panatag (Scarborough) Shoal by the governments of China and the Philippines takes effect. July 18 | China blocks Philippine ships and fishing vessels from the lagoon of the disputed Panatag (Scarborough) Shoal by setting up barriers to its entry point. July 13 | China's People's Liberation Army Navy (PLAN) missile frigate Dongguan runs aground on Hasa Hasa (Half Moon) Shoal, a contested maritime territory just 60 nautical miles from the Philippine island of Palawan. June 21 | China's powerful Central Military Commission approves the formal establishment of Sansha, a military garrison for the disputed South China Sea. September 12 | Philippine President Benigno Aquino III promulgates Administrative Order No. 29, naming maritime areas on the western side of the Philippine archipelago as the West Philippine Sea. September 19 | Senator Antonio Trillanes IV emerges as a negotiator working independently for Philippine President Benigno Aquino III in Beijing. November 11 | Following a 3-month standoff between Philippine and Chinese vessels around Panatag (Scarborough) Shoal, China informs the Philippines that Chinese coast guard vessels will remain permanently on the shoal by developing Sansha. January 22 | The Philippines files an arbitration case against China at the United Nations-backed Permanent Court of Arbitration (PCA) to settle the maritime dispute. The Philippines invites China to join the proceedings. February 19 | China officially rejects a Philippine move to bring the long-running territorial issues over the South China Sea before the PCA, saying Manila's claim is "legally infirm and carried unacceptable allegations against Beijing". May 21 | 30 Chinese fishing vessels, including 3 Chinese government ships, are spotted for more than a week at Ayungin Shoal, part of the Kalayaan Island Group off Palawan. May 23 | The Philippines vows to "defend what is ours" as part of a standoff over a Chinese warship circling a South China Sea reef, which is occupied by Filipino Marines. June 7 | China releases a new map of China, adding a 10th dash on the eastern side of Taiwan. In its 2013 map, China claims the 10-dash lines are its "national boundaries," without again explaining the legal basis or giving the fixed coordinates for the dashes. July 5 | Chinese ships return to Panatag (Scarborough) Shoal a few days after they left the area off Zambales in the West Philippine Sea. November | Super Typhoon Yolanda (Haiyan) sends home Chinese maritime and Navy vessels at the Ayungin Reef in Palawan, while the half a dozen Filipino Marines on board a rusting and grounded World War II-era ship are safe. January 1 | China imposes a fishing permit rule in the West Philippine Sea, defying the objections of the US, the Philippines, and Vietnam. January 27 | The Philippines protests the Chinese coast guard's alleged firing of a water cannon at Filipino fishermen in the Philippines' Bajo de Masinloc. February 26 | China offers the Philippines incentives such as the mutual withdrawal of ships from the disputed Panatag (Scarborough) Shoal. March 10 | The Philippine Department of National Defense confirms that two Philippine ships are expelled by the Chinese coast guard from Ayungin Shoal in the Spratly Islands. March | A Philippine government vessel evades two Chinese coast guard ships trying to block its path to deliver food, water, and other troops to a military outpost on the shoal. March 29 | The Philippines slams China after two of its ships harassed a Philippine vessel in the disputed Ayungin Shoal, a day before the Philippines files a pleading at the Permanent Court of Arbitration in The Hague. March 30 | The Philippines submits a 4,000-page pleading or memorial to the Permanent Court of Arbitration in The Hague in its case against China. The tribunal requests China to submit a counter-memorial, but China rejects this request. April 28 | The Philippines signs the Enhanced Defense Cooperation Agreement (EDCA) with the US, which allows for enhanced "rotational presence" of US military forces and for US supplies to be stationed at military bases in the Philippines for a period of 10 years. May 6 | The Philippines charges 11 arrested Chinese fishermen for illegal poaching at another disputed shoal, and publicly accuses China of carrying out reclamation work ostensibly done to prepare for the construction of an airstrip on Johnson South Reef. May 15 | The Philippines releases photos of China's "destabilizing" moves in the West Philippine Sea (South China Sea) showing suspected airstrip construction on the Mabini (Johnson) Reef. June 3 | The arbitral tribunal handling the maritime dispute between Manila and Beijing orders China to respond to the case filed by the Philippines not later than December 15, 2014. June 25 | The Philippines criticizes China for publishing a new map that expands Beijing's claim over the West Philippine Sea by using a 10-dash line as demarcation. August 17 | The Philippines slams China for conducting regular "sovereignty patrols" in the West Philippine Sea by deploying ships with the sole purpose of staking Beijing's claim in the disputed waters. October 7 | Beijing completes a runway for military aircraft on a West Philippine Sea island also claimed by Vietnam, state-run media report, as it asserts its territorial claims in the area. December 5 | The United States State Department releases a report concluding that China's 9-dash-line claim does not follow the international law of the sea. December 7 | China issues a position paper accusing the Philippines of violating and abusing international law by filing a legal case it rejected on technical grounds. April 20 | China reportedly starts reclamation and transforms the Panganiban (Mischief) Reef into a forward naval station. 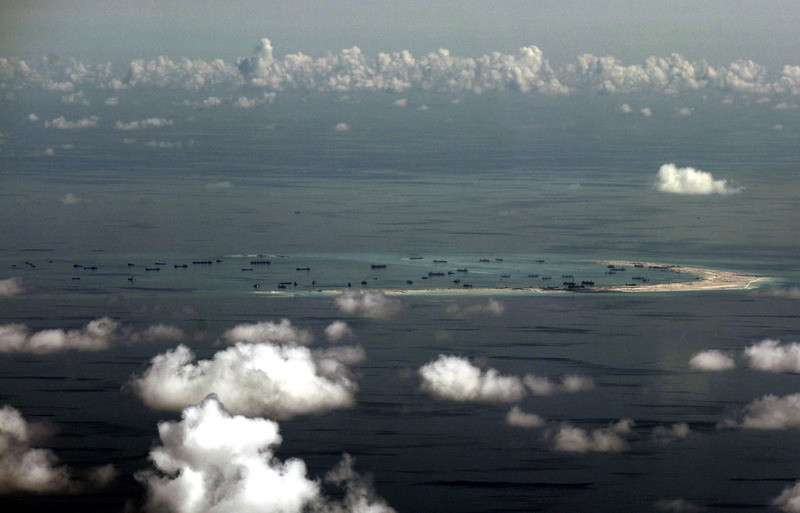 According to UNCLOS, artificial islands do not afford the occupying nation territorial waters. July 7 to 13 | The Permanent Court of Arbitration at The Hague hears the Philippines' oral arguments on whether the tribunal has the right to hear its case against China. During these hearings, "all Chinese arguments on jurisdiction and admissibility… were properly considered." September 20 | China completes a 3,125-meter runway on Fiery Cross Reef which is also claimed by the Philippines as Kagitingan Reef. October 29 | The PCA rejects China's strongest argument against the Philippines: that the tribunal has no right to hear the Philippines' case over the West Philippine Sea. November 24 | China reaffirms that it will "not accept" a judicial arbitration on the West Philippine Sea. November 24 to 30 | The tribunal conducts a hearing on the merits of the Philippines' case. The tribunal gives the Philippines and China until December 9, 2015, "to review and submit corrections to the transcript of the hearing." January 7 | China reportedly builds a submarine harbor at Panganiban (Mischief) Reef located in the West Philippine Sea near Palawan. January 13 | China finishes construction on a second 10,000-ton China Coast Guard (CCG) cutter destined for patrols in the South China Sea. February 19 | The Philippines slams China over reports that Beijing deployed missiles on an island in the disputed area. March 18 | The United States said it fears that China is planning to build an artificial island in the disputed Panatag Shoal (Scarborough Shoal). March 19 | The Philippines and the United States agree on 5 local bases (Antonio Bautista Air Base in Palawan, Basa Air Base in Pampanga, Fort Magsaysay in Nueva Ecija, Lumbia Air Base in Cagayan de Oro, and Mactan-Benito Ebuen Air Base in Cebu) where US troops will be allowed to build facilities. April 14 | The US launches joint South China Sea naval patrols with the Philippines, escalating its presence as it accused Beijing of "militarizing" the region. May 10 | China's navy launches annual war drills in the South China Sea with one of its most advanced warships. The exercises include simulations for breaking an enemy blockade and reconnaissance drills with submarine forces. May 23 | A Chinese government bureau says it is planning to build a base station in the Spratly Islands to aid fishing boats in trouble and shorten the distance they need to travel. June 14 | Countries in Southeast Asia say they have "serious concerns" over recent events in the disputed South China Sea, an unusually strongly worded communique issued by their foreign ministers in China. The statement, however, is later retracted due to the alleged withdrawal of Laos and Cambodia. June 16 | US fighter planes arrive in the Philippines for a training mission and operations to ensure access to the disputed South China Sea. June 29 | The PCA confirms that it will issue its ruling on the Philippines' case against China on July 12. June 30 | Beijing says it will reject any ruling by an international tribunal in a contentious case brought by the Philippines over the West Philippine Sea. July 12 | The PCA announces that an arbitral tribunal has ruled in favor of the Philippines in its historic case against China.